I always knew I was going to need focus control of some sort. Not much point being able to have my camera move around if it couldn’t keep its subject in focus. 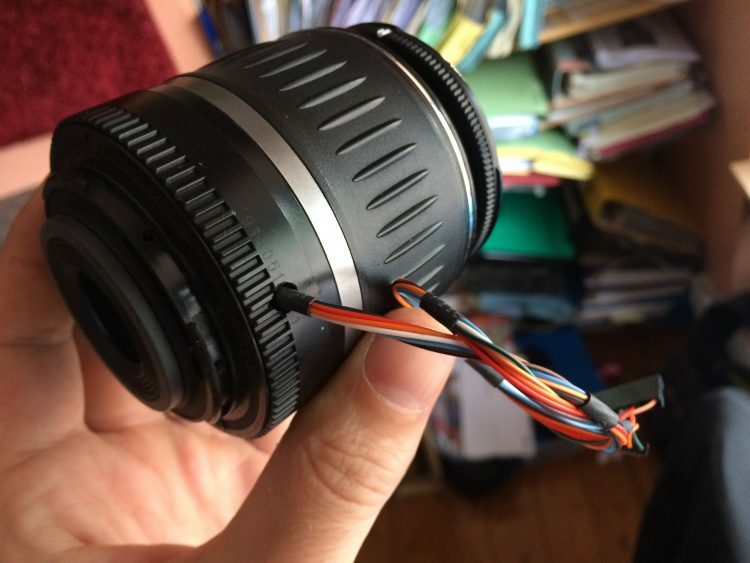 Traditionally this is done externally to the lens: professional cine lenses all have gear teeth running round the focus ring so you can drive the focus remotely, either mechanically with a flexible shaft with a knob on the end (a follow focus) or with a motorised gear controlled down a wire. But I’ve already got good DSLR lenses and I want to use them. And they’re autofocus lenses so they’re already motorised – all the hard mechanical work has already been done. But how to control them? I could always open them up and hook a motor driver up directly to the tiny motor inside them. 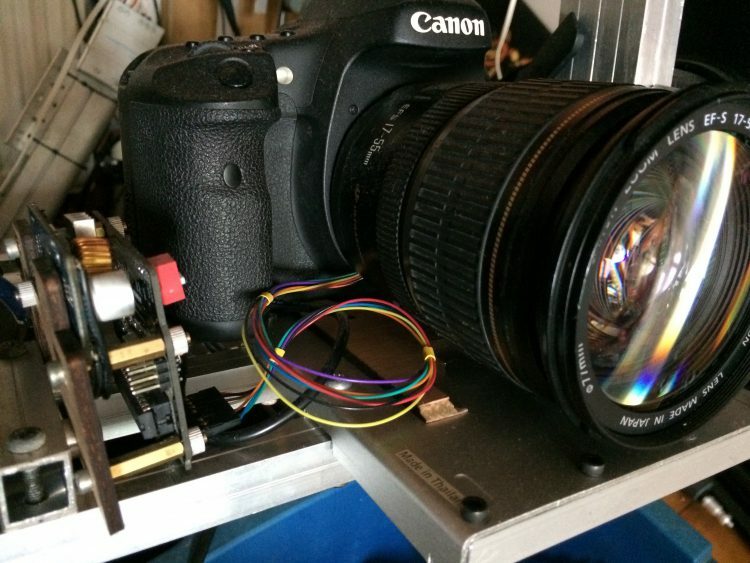 My better lenses use ultrasonic motors, though, which may need rather exotic drivers to make them run. And I don’t know what sort of feedback mechanism the lenses use to track how far the motor has run or what distance the lens is focussed on. A nicer option is to just pretend to be the camera. 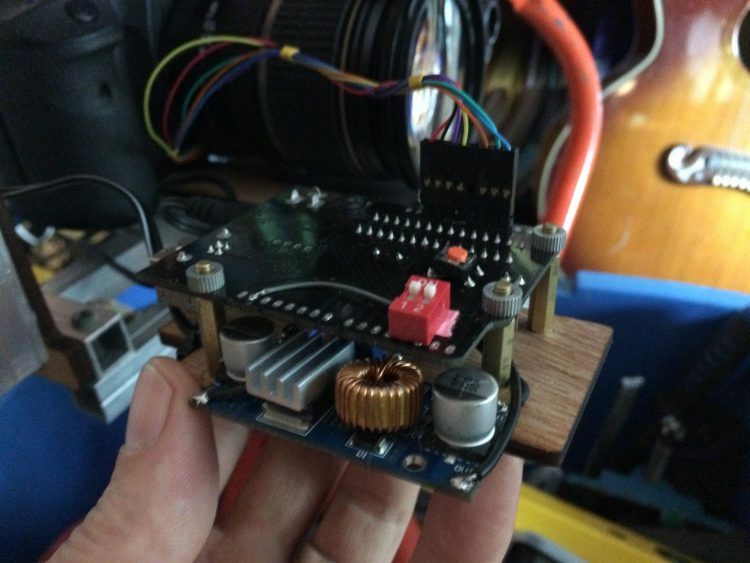 Rather than hacking the lenses up and removing their micro controllers, just communicate with them the same way a camera would. And it turns out some nice people (https://pickandplace.wordpress.com/2011/10/05/canon-ef-s-protocol-and-electronic-follow-focus/) have been investigating the EF Lens protocol that my camera and lenses use, and have deciphered enough of the commands to control the basic stuff you need: focus and iris. Cool. 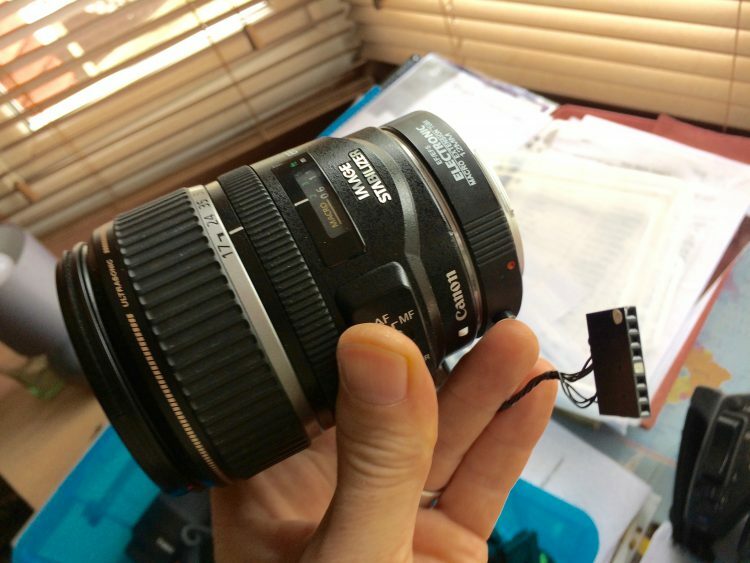 First step – take the electrical contacts out of a cheap lens, and solder wires in their place. Now the camera can’t talk to the lens, but I can. I connected it up to an Arduino, and started poking commands at it to see what happened. Success! Just getting the lens to move at all without the camera feels like a triumph, but there’s a long way to go. The downside is that when you want to actually film something, you now have a macro extender between the lens and the camera, which changes the focus range of the lens significantly. Great for ultra-closeups (well, it is a macro extender) but no good for anything more than a foot or two away. 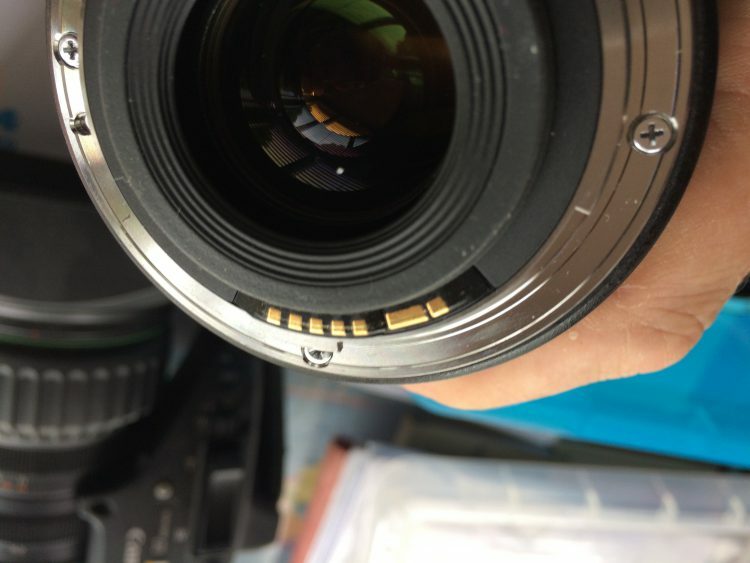 And some lenses are unusable with an extender on; their focus range ends up being pretty much inside the lens itself. One of the big issues with trying to control a lens like this is that it’s not what the lens was designed for. I want to be able to say “set your focus to exactly 300mm…. now pull back to 297mm …” etc. But these lenses are designed for auto-focus, which means neither they nor the camera ever need to know the distance they’re focussing on, just that the subject is in focus. The lens can step the focus forwards or backwards by tiny discrete amounts – steps – but doesn’t need to know what effect it’s had on the focus distance. And the camera is only interested in the sharpness of the subject (which it can measure by looking at the highest frequency in the data coming in). So it’s normally more a hunt than anything else. The camera looks at the image coming in, decides which way out of focus it is and roughly how much, then tells the lens “focus 20 steps towards infinity”. Then it looks at the image now coming in, and corrects and fine tunes the focus: “3 steps inwards”, “ok, just 1 step back out again”. Smart look-up tables for each lens give the camera help in picking the right number of steps to use for each guess, but it’s an iterative process. Distance measurement doesn’t come into it. So: autofocus lenses shift focus in steps, but I need to know distances. To make things more awkward, each lens has different mechanics and motors and therefore the number of steps, and how many steps a lens takes to shift the focus by an inch all vary widely. And the relationship between steps and actual focus distances is distinctly non-linear, too (the hint is that word “infinity”) so while 10 steps at the near end of the lens’s range may shift the focus by a few millimetres, at the far end 10 steps may shift it by 100 metres. All this means look-up tables are the way to go. 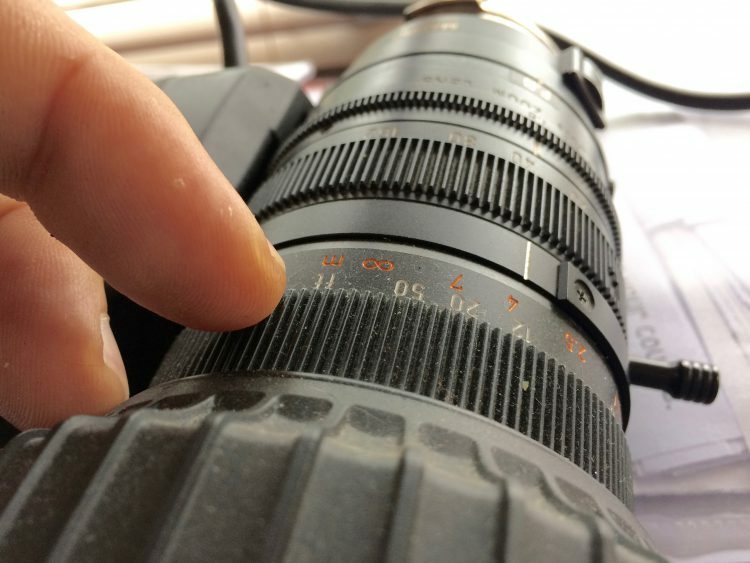 I can tell the lens to pull the focus all the way in to its closest focus, then have it move out by 10 steps at a time, and measure and record the distance that’s in focus. So I printed out a nice sharp focussing chart (just a nice sharp picture to focus on), set the camera up on a tripod, and hooked up an external monitor to it so I could check the focus without needing to squint through the viewfinder. Then, tape measure in hand, stepped through the first lens’s range of focus, moving the focussing chart back and forward in front of the camera until it was at it’s best focus, and noting the distance each time. But it wasn’t working properly. For this to work, I need to know that if I tell a lens “move focus 10 steps forward” then “move focus 10 steps back again” it’ll end up focussing on the same spot it started at. 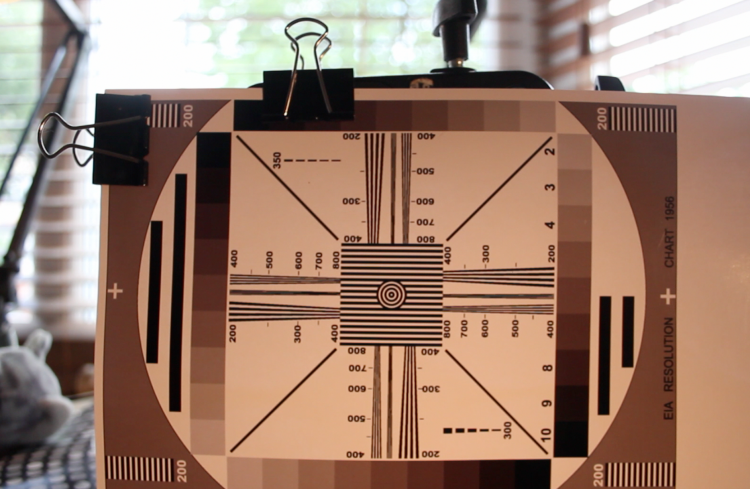 But the first lens I tried profiling didn’t do that. And while telling it to reset to its closest focus always brought it to the same spot, if I stepped it forward by 100 steps, it ended up at a different position than if I stepped it forward by 10 steps ten times in a row. Like the lens was losing steps. Not good. The lenses do kind of keep track of their current position, but even that’s not without its issues. All autofocus lenses have a manual option; a focus ring you can grab with your paw and twist to focus. 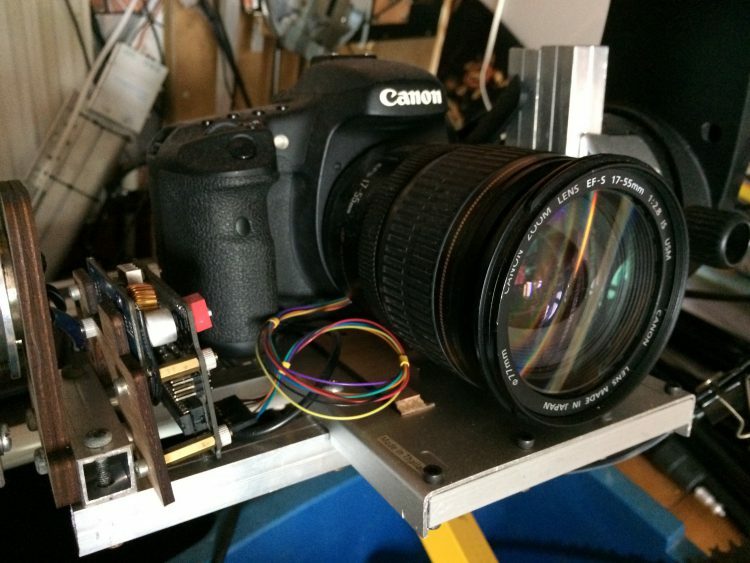 Some lenses have a mechanical switch that disengages the autofocus motor, but some have a slipping clutch that lets you manually focus at the same time as the motor (which probably annoys the camera). 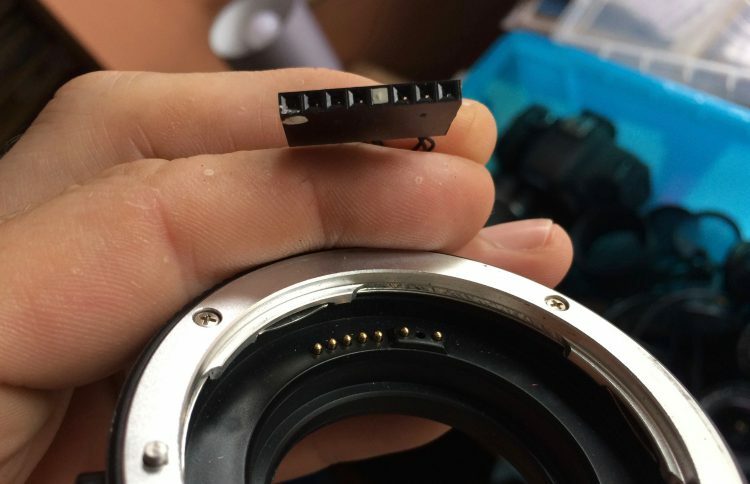 But this means the lens can only tell you how many steps cumulatively it’s tried to move the focus since it was powered on, but it has no idea if that’s where the lens focus actually is right now. Bit of a show-stopper for me, though. The only way I can track where the lens is, is by dead-reckoning; moving the lens to a known point (the nearest focus point), resetting my counter, then just blindly sending commands and keeping track of how many steps back and forth I’ve asked it to do. Thought I might as well try a better lens, just to see. My EF-S 17-55mm IS USM lens worked perfectly. As long as I didn’t touch the manual focus ring, I could send it off to a hundred different points of focus, and back to a point near an end-stop (but not actually *on* the endstop, as that’s the one place I know any lens will be consistent), and the lens came back to the right spot every time. Well, within a gnat’s whisker of it. 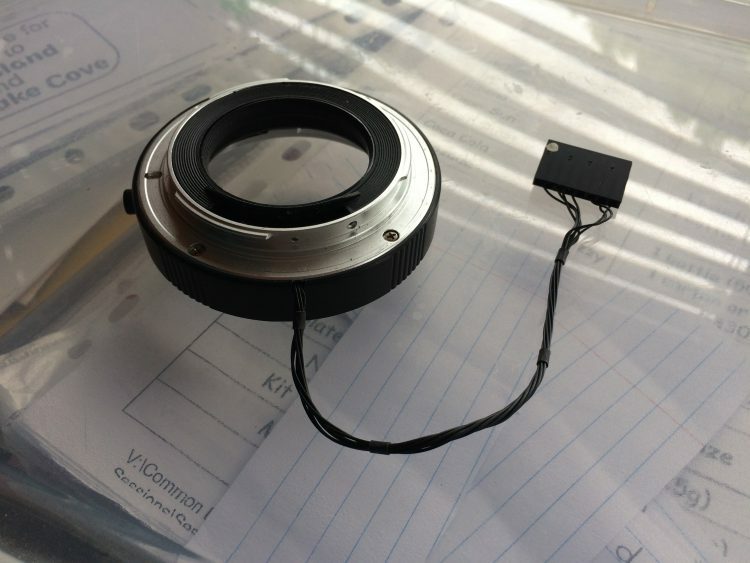 So: my posh expensive “ultrasonic motor” lens worked. We’re back on track. I tested my other lenses; for the most part, the more expensive, the better. There are different flavours of ultrasonic motor. The better ones are ring-type, where the motor is in the form of a ring that surrounds the focus elements inside the lens, and it more or less directly drives the elements with a minimum of extra gears and cogs. There are cheaper lenses around that get to say they’re ultrasonic although internally they’re very similar to a normal lens: they have a tiny motor (albeit ultrasonic) positioned to the side of the focus elements, with lots of gears and a rack and pinion affair to actually drive the elements. I set up a quick camera move in Blender, and had Blender calculate the focus distance for each frame along with the motion data. It’s supposed to be focussing on the lego man, but when I measured the scene up to recreate in Blender, I tape-measured to the top of the tripod he’s standing on instead. After shooting the motion, I dropped the video into After Effects and superimposed a star-field over the top to see how well the camera’s actual motion matched the trajectory I’d created. Hence the dots. I haven’t gone into the actual EF protocol at all here, and it’s not without its quirks. I’ll write an article on it at some point. Google will get you started, though. Also, I had to do some hacky coding to deal with the fact that EF lenses tend to ignore commands if they’re busy. An ignored command is a show-stopper: all moves from then on will be wrong. There are different kinds of “busy” as far as the lens is concerned, though, and it may report itself as not busy (i.e. ready for commands) when it’s in the middle of moving the lens, and then it’ll ignore the new lens move command. So if you’re following in my footsteps, you’ll need to send the bytes 0x90, 0xB9, 0x00 to the lens, and if the byte that comes back in response to that final 0x00 is either 4 or 36, the lens is moving. So wait a bit and try again, otherwise your command will be acknowledged but ignored. So here’s a great idea. I use the Canon EOS-M and EOS-M5. Which have manual controls and the same great sensors as the 60D and 80D respectively. These require – guess what – an ADAPTER for EF and EF-S lenses that costs like $50 for the 3rd party version, and set the exact proper focal distance. That’s actually pretty much all they do – no glass, just connect the lens and the electrical contacts.